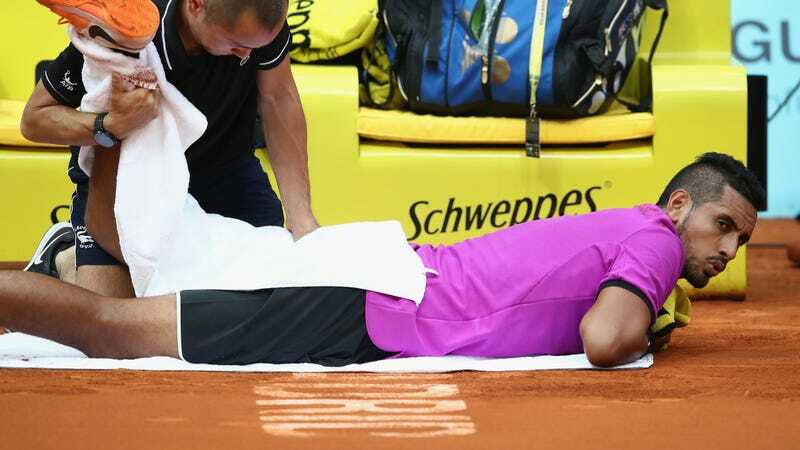 In each of his last two matches, Nick Kyrgios has clutched at his injured hip a whole lot, and, with time, effectively given up. One of those losses was understandable—even at full health, he had slim chances of stalling Rafael Nadal’s freight train through clay—but today’s 2-6, 6-4, 6-2 upset by world No. 94 Nicolas Kicker is much harder to explain away. Right now Kyrgios is hobbled, chronically by hip and constantly by mind, though it’s hard to discern the current proportion. While he has yet to make any statement about his French Open prospects, a first-match exit at the Lyon Open doesn’t bode well for grueling best-of-five on clay next week. It’s conceivable that he might choose to rehabilitate and wait for the faster surfaces that better suit his style of play. Even though Second Serves Aces Only is a familiar incarnation of Kyrgios—cf. his defeat of Novak Djokovic at Indian Wells—it’s not always a winning one. While it’s true that he could blow Kicker off the court basically at will, he often doomed himself by going for far too much. Down set point, he took a second stab at a screaming serve out wide; it died on the net cord instead. Kyrgios finished the match with 16 aces and nine double-faults, to offer a sense of his risk appetite and patience levels today. He won only eight of his last 46 points on return. To qualify as actual “rivals,” both parties must hold up their end of the bargain. Zverev has now marked his territory, winning his first Masters 1000 in Rome and continuing what looks like an inevitable ascent towards household-name status. Though Kyrgios has won both of their previous encounters, his play has lapsed right as his peer’s has peaked. With a deep run at the French Open looking increasingly unlikely for Kyrgios, we’ll have to wait a little longer still. The opportunity was ripe, though: Rafa aside, the field is as permeable as it’s looked in a long time, and it would’ve been perfect timing for the two young guns to simultaneously assert themselves at a Grand Slam.